Did Netanyahu appeal to Turkey? Israel has appealed to Turkey with a request to resume its mediator role in the indirect peace negotiations with Syria, Qatari daily al-Watan reported Thursday, quoting Turkish diplomats. Turkish Prime Minister Recep Tayyip Erdogan met Wednesday with Syrian President Bashar Assad in the northern city of Aleppo, and told him that his country "has received requests to resume its mediation between Syria and Israel. 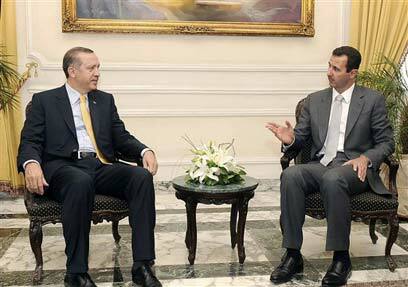 He added that Ankara was willing to do so, but did not state the origin of the requests. According to the Turkish sources, Erdogan briefed Assad on the content of the messages he received from Israel, which called on his country to reignite the indirect talks. The report added that the two leaders agreed that peace "must be just and include all channels." The same sources told the newspaper that Erdogan had managed to overcome the crisis in his country's relations with Israel following the Israeli offensive in Gaza, and that Syria and Israel continued to trust Ankara's mediation. According to the sources, obtaining peace has become a need and even a necessity for Syria, Israel, the United States and even Turkey. Ankara, the report explained, believes peace can be reached between Jerusalem and Damascus more easily due to the fact that the four rounds of indirect negotiations have laid the necessary foundations for launching direct talks. Another matter contributing to the efforts is the need for permanent stability by major Turkish companies operating in Syria. Al-Watan also reported that a Syrian official welcomed the American administration's stand on Jewish settlements, demanding a complete stop to settlement construction. The source noted the importance in summoning the Israeli ambassador to Washington to the State Department for a protest on the ongoing construction in east Jerusalem. The same source stressed that this move served as a significant development in the relations between the US and Israel, which has not been seen in the past, and that Damascus must therefore support the American stand. See all talkbacks "Report: Israel asked to resume Syria talks "